A week after they ran a featured cover story headlined: “The mystery of Melania,” the Daily Telegraph has apologised and agreed to pay substantial damages to the US First Lady. In an extraordinarily candid correction issued last Saturday, the newspaper stated how the story “contained a number of false statements which [they] accept should not have been published”. For once, a national newspaper corrects and apologises quickly for serious inaccuracies about someone. That’s great, right? National newspapers should correct and apologise quickly for such serious errors, of course. But most victims of libel or serious inaccuracy spend months, if not years, in legal proceedings, or battling against IPSO, to get some kind of justice – not a detailed correction, apology and settlement in days. Leveson found that it could be ruinously expensive for newspapers to defend legal claims – especially when the litigants were wealthy. Yet, the wealthy and the powerful are precisely the people who should be the subject of press enquiry and investigation. Equally, Leveson found that some ordinary people who were the victims of libel were being deprived of access to justice, as going through the courts can be so risky and costly. Leveson’s solution? A new mechanism to dramatically cut legal costs for newspapers, while making it possible for anyone illegally wronged to bring a claim – provided it was genuine. It was a breakthrough for freedom of expression – or it would have been – if it wasn’t for the fact that the Daily Telegraph and other newspapers opposed it at every turn and continue to reject the system. Their rejection exposes the fact that corporately, some of these newspapers aren’t very interested in freedom of speech at all. And now, whenever faced with legal action from a wealthy claimant, The Telegraph has little choice but to settle quickly and humiliatingly. The Telegraph should join an independent regulator and campaign for the full Leveson system to be implemented, so they wouldn’t have to worry about bankruptcy after a costly lawsuit. Newspapers should be speaking the truth to the powerful and standing up for the voiceless. 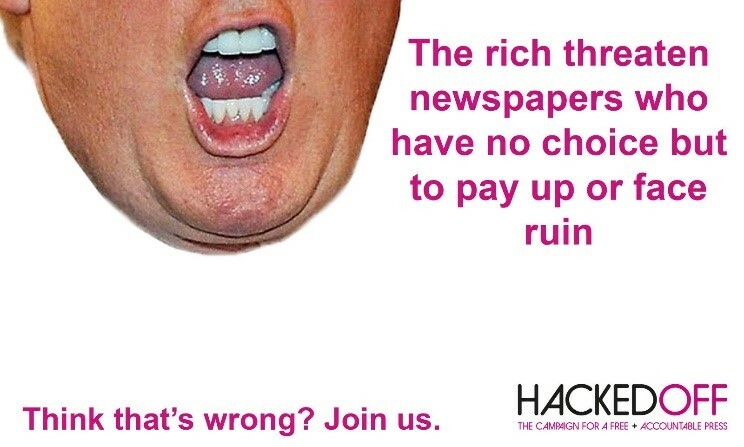 But, because they rejected the Leveson system, most newspapers are running scared from the rich, while ordinary people are left defenceless. Agree? Please share our tweet here.